As one of the smoothest cutting tools any woodworker will have, a band saw is on just about the same level of versatility as a router. Used primarily for cutting curves or other unusual cuts into wood, a band saw is also used to rip lumber, make cross cuts, or even cut metal. They come in various sizes, from large floor-standing models, smaller benchtop models, and portable electric models (corded and cordless). The best band saw will be sturdy, long-lasting, and powerful enough to handle whatever task you throw at it as long as you understand its limitations. Band Saw vs Table Saw – Do You Need Both? 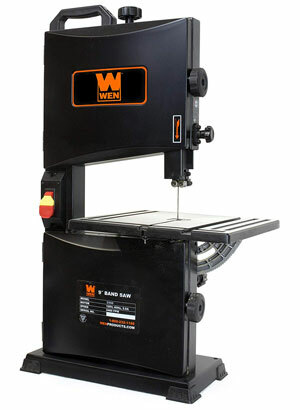 For the money, the WEN 3962 is one of the best band saws you’ll find. The 14-1/8 by 12-1/2 inch table gives plenty of room and can bevel up to 45 degrees for angle cuts. A 3.5 amp motor allows you to run the 3962 at either 1520 or 2620 FPM (feet per minute), making it easier to work with a wider range of materials. The bench comes complete with a 2-year warranty, 3-in-1 dust port, fence, miter gauge, and work light. You can fit 72-inch blades with 1/8 to 1/2 inch thickness into the 3962, allowing you to make cuts up to 9.75 inches wide and 6 inches deep. A 3/8 inch blade with 6 teeth per inch is included to let you get started as soon as the saw is assembled. When you want smooth cuts without breaking the bank, you go WEN. This is something that many first-time users quickly learn. While not industrial-sized, the 3962 brings industrial quality to your home workshop. In the rare event of a problem, WEN’s customer service has yet to disappoint consumers. A common complaint with WEN products is that they’re almost too precise, making adjustments difficult. Switching to a thinner blade is especially difficult, as the balance must be perfect to prevent your blade from dislodging. Make a trip to YouTube and be ready to mark your settings with a permanent marker when changing blades. The good news is, once properly adjusted, WEN saws are pretty much unbeatable in terms of precision and price. A floor-standing band saw can be an important part of a busy workshop, and Grizzly’s G0555LX is designed to surpass expectations. Featuring computer-balanced, rubber tired wheels, cast iron frame and table, and all ball bearing construction, this is one band saw that can handle abuse. The Grizzly saw has a 13-1/2 inch throat capacity and 6 inch maximum cutting height so it’ll better handle jobs the smaller WEN above can’t. Its blade runs at either 1,800 or 3,100 FPM. This 14-inch, CSA-certified model is more than enough for almost any task, while its size allows it to be installed in places a 16-inch model won’t fit. The 1 HP motor provides plenty of power for most jobs. 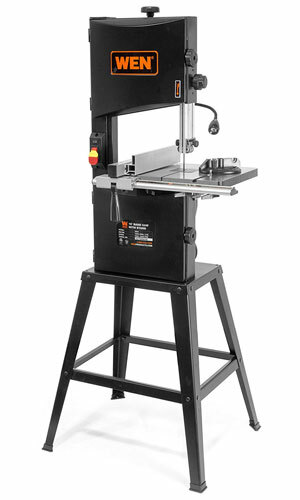 Band saw reviews are quick to point out that Grizzly products are made in Taiwan but you may be surprised to learn that tools made there are often on par with those made in the USA. 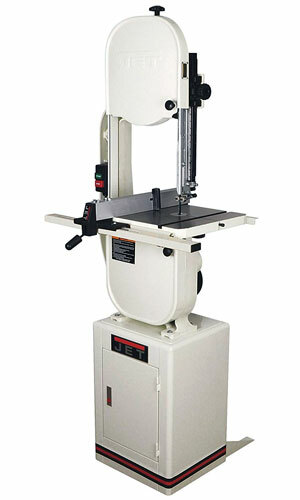 Many owners are insistent that this may in fact be the best 14-inch band saw you will own. There’s an almost universal agreement that the durability and optional upgrade parts make the G0555LX their favorite band saw. 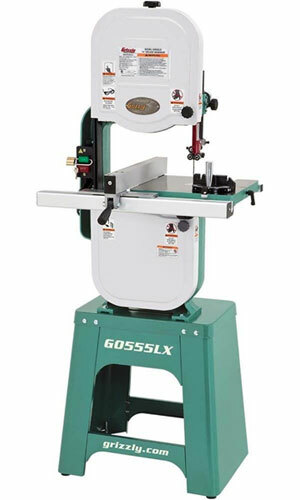 The single largest complaint about the G0555LX isn’t in regards to the band saw itself, but regarding delivery. Because of the weight (~250 lbs), some of the delivery companies which hold contracts with Grizzly have been known to damage the product while unloading or cause other problems. Consumers who have encountered this issue have been very vocal about these companies, and have also noted that Grizzly customer service is generally very prompt at replacing any parts damaged by poor delivery. It should also be noted that while the saw comes with one blade, it is meant to serve only as a starter. Grizzly has included it with the intention that it be replaced with a more permanent blade that meets the user’s preferences after delivery. Built to be sturdy, the 10-305 uses a steel plate for the frame and a cast iron table with a 13.75 by 12.5 inch work surface. A safety paddle helps you prevent accidents, while the rip fence is designed for easy removal when you need to do freehand work. The micro-adjustable guide post makes precision a snap with the turn of a handle. This saw uses 70.5 inch blades and can cut down to 4.625 inches on both straight and 90 degree angle cuts. A starting blade made of carbon steel is included. This is a good choice for small workshops due to its reduced footprint and extra sturdiness. Users also report that adjustments tend to be a lot easier than the “big boy” models, such as those by Grizzly. It should also be noted that Rikon produces Craftsman band saws, so you’re getting a very similar level of overall quality here. When looking for a powerful saw, this may not be your best choice. It doesn’t fare well against hardwood, and consumers tend to reserve it for small to medium projects. Another design flaw experienced by a few is that the guide wheels aren’t aligned properly, requiring you to readjust them every time you change the cutting height. Sometimes you need a bigger saw to get the job done, and this cast iron framed band saw doesn’t disappoint. An easy to view blade tracking window and rack and pinion adjustment for the blade guide give you increased accuracy. To make cutting big pieces of wood easier, this saw features a built-in 12 inch resaw capacity. Meanwhile, the two-speed poly-v belt drive system provides greater control when switching between hard and soft woods. Despite its weight, this saw arrives in two pieces that are easily assembled. Many consumers start working with it almost immediately, thanks to the settings preset for the included blade. And speaking of the blade, users are happy to report that (while not expensive by any means) the included blade is adequate for quite a few jobs. There are a couple complaints with this saw. The biggest one is the need for foot attachments to maintain stability instead of making the base a solid unit. Second is the fact that this saw doesn’t come with a fence or miter gauge. Finally, replacement parts often come with inflated prices, so it’s best to get parts from your local hardware store instead. Considered to be perhaps the best benchtop band saw of its size, the 3960 has a 2.8-amp motor capable of spinning blades at 2,460 feet per minute. The one foot square work table is able to tilt up to 45 degrees, while the 62-inch blades can cut up to 3 5/8 inches deep. Included with the 3960 are a dust port, miter gauge, quick release blade adjustment lever, WEN’s standard two-year warranty coverage, and fence. Consumers who use the 3960 tabletop band saw love the way it cuts compared to other stationary saws of its size. The machine is able to cut incredibly straight lines with even the thinnest blades, although a good deal of adjusting is required for optimal functioning. The addition of a work light and the large working surface have also brought many compliments. The single biggest problem reported by consumers occurs with the set-up. It requires a lot of patience and work to properly adjust this saw, and many give up due to a lack of markings on the tension springs and high overall sensitivity. Another common complaint comes in the form of how this small band saw handles. Like other 9- to 10-inch saws, the 3960 has far less power and stability than a larger 14-inch model, like the Grizzly or Jet models here. This tabletop model gives plenty of bang for the buck. A 2.5 amp motor allows for single-speed power that allows work with both wood and metal. The rip fence helps make your cuts more accurate, while the enclosed 6 TPI blade gives enough bite to get you going. You can set the angle and height of the saw easily, thanks to the rack and pinion adjustment, and a 1-1/2 inch dust port ensures your workspace doesn’t get clogged up. As with many larger models, this saw includes an articulated LED work light for improved visibility. Portability is the keynote of this saw. It has enough power to satisfy the needs of most hobbyists and most issues can be solved by checking the drive belt. Customers also found the accessories to all be excellent quality for the price. 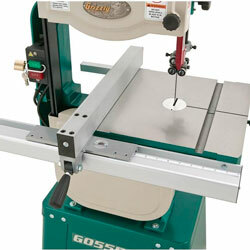 While the 3386-01 can handle smaller projects with ease (up to a 3.5″ resaw) , it lacks the raw power of bigger models. There have also been issues with the motor heating quickly, and you may need to do more adjusting than in larger saws. 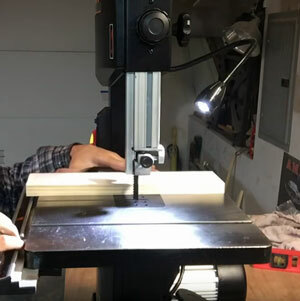 This band saw isn’t the best choice for veterans, but if you’re just starting out, then this is a great saw to learn on. 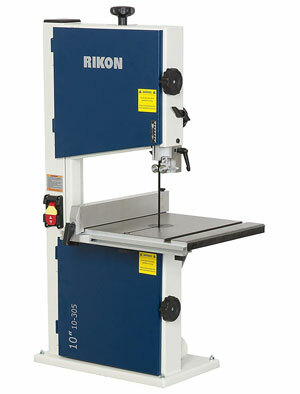 With so many types of saw on the market, you might be wondering if adding a band saw to your workshop is necessary. The following common questions will help you decide if a band saw is right for you. Band saws are an extremely versatile saw that’s valued by both home and professional users alike. Not only can it resaw and smooth edges, but the high accuracy makes it an excellent choice for making veneers and laminations. Its main use is cutting irregular shapes due to its thin blade. Additionally, resawing or ripping wood into thinner pieces is another common use. This is a rather complicated issue, because both saws do different things better. Table saws are a staple of workshops, and they excel at long, straight cuts. They’re perfect for cutting squares. Band saws, conversely, are excellent for making curved cuts. They’re going to be your best friend when you need to do detail work, and a skilled craftsman can use a band saw to perform most of the tasks a table saw does. That said, a table saw is essential for doing partial cuts compared to band saws, and every starter shop should have one. 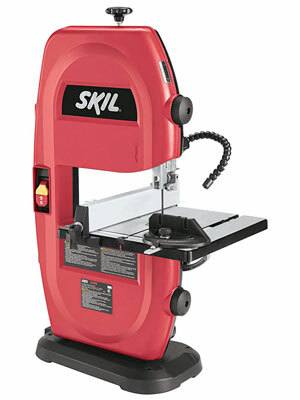 More advanced shops should have both tools at their disposal, so whether you want just one or both, it’s best to consider what you’ll be using your saw for and your skill level at using the thinner blades of a band saw to do the main jobs of a table saw.